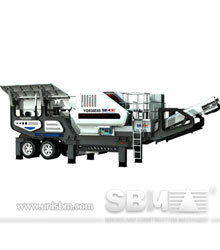 SBM Y3S-vsi series portable plants take our vertical shaft impact crusher (vsi crusher) as the key crushing equipment which guarantees the final products’ quality and whole plant’s efficiency. There are now four types of Y3S-vsi series portable plants for your choices, which are exactly Y3S154VSI71, Y3S184VSI81, Y3S186VSI92 and Y3S216VSI14. SBM Y3S-vsi series portable plants take our vertical shaft impact crusher (vsi crusher) as the key crushing equipment which guarantees the final products’ quality and whole plant’s efficiency. There are now four types of Y3S-vsi series portable plants for your choices, which are exactly Y3S154VSI71, Y3S184VSI81, Y3S186VSI92 and Y3S216VSI14. Equipped with the famous SBM rock-on-rock vertical shaft impact crusher (VSI), Y3S-vsi series portable vertical shaft impact crusher plant will be your right choice during the second, third or fourth crushing stage in order to secure high cubicity of the end products. "I am pleased at cooperation with SBM "